With the current trend of using more ecological and recyclable materials, the Bio Banner from Eurosystems, an eco-friendly wooden portable Banner stand, is the perfect alternative to metallic roll up banners for projecting your companies image and graphics, when displaying at a trade show, retail space, or on any exhibition stand. Using double or single sided graphics, measuring 800 mm wide by 1900 mm in length, the Bio Banner is the ideal portable banner Stand for interior displays, receptions, showrooms, point of sale for shops and on exhibition display stands. For greater visual impact, two Bio Banners can be combined to create one large graphic display. 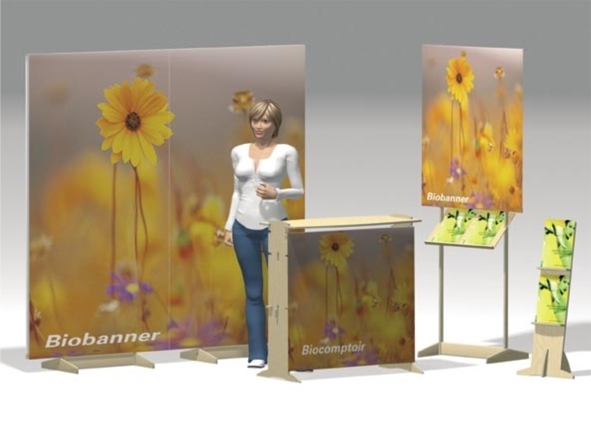 The Bio-Systems range of exhibition display systems, which started with the Bio-Banner, has now been expanded to include a reception style desk (Biocomptoir), and a brochure holder. These additional items are created from the same materials, and use the same method of attaching Graphics. The Bio Banner has also been modified to include a version that can support an inclined literature shelf. All items in the range can be easily disassembled and stored with the Graphic in individual bags. The Bio Banner is made from untreated wood of European managed forests and is 100% recyclable. Duo GB Ltd have their own design and graphics department, specialising in exhibition stand design, large format digital printing, graphics, portable banner stands and exhibition pop ups. All exhibition stands and systems from Duo GB Ltd can incorporate custom designed graphics developed in-house at our midlands based office. Using a variety of applications such as light boxes, stretch fabric ceilings, drop papers and printed graphics can greatly enhance an exhibition stand or interior display.